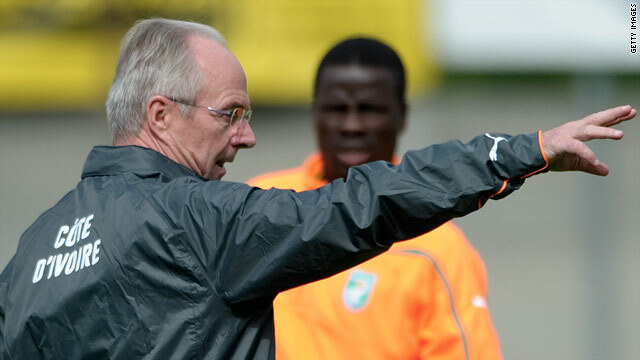 Coach Sven Goran Eriksson has selected an attacking Ivory Coast squad for the World Cup, complete with six strikers. (CNN) -- Ivory Coast coach Sven-Goran Eriksson has selected six strikers in an attacking 23-man squad for the World Cup finals. Chelsea pair Didier Drogba and Salomon Kalou, Aruna Dindane, who recently moved to Qatar League side Lekhwiya, CSKA Moscow's Seydou Doumbia, Lille's Gervinho and Emmanuel Kone, of Romanian club CFR Cluj, have all made the cut. Eriksson has dropped seven players from his original squad, they are goalkeeper Vincent Angban, defender Abdoulaye Meite, midfielders Gilles Yapi Yapo and Emerse Fae, and strikers Bakari Kone, Kanga Akale and Lassina. Yapi Yapo, Fae and Kone all played at the World Cup in Germany in 2006. The Swedish coach informed his players at their base of Gstaad, Switzerland, on Tuesday morning. The Elephants have been drawn in the so-called group of death along with Brazil, Portugal and North Korea. They begin their campaign against Portugal on June 15. Much will be expected of Drogba, who finished as the leading scorer in the English Premier League after netting 29 goals for Chelsea. Notable names in the squad include defenders Emmanuel Eboue, of Arsenal, and Manchester City's Kolo Toure, as well midfield duo Didier Zokora, of Sevilla, and Barcelona's Yaya Toure. South Africa coach Carlos Alberto Parreira has dropped the World Cup hosts' all-time record scorer Benni McCarthy for the tournament starting on June 11. The 32-year-old has struggled for form and fitness this season, having moved English clubs from Blackburn to West Ham, but was recalled by Parreira after the Brazilian returned for his second stint in charge. However, McCarthy -- who played at the 1998 and 2002 World Cups -- featured in only one of the team's four warm-up friendlies and was an unused substitute as Bafana Bafana romped to a national record 5-0 win over Guatemala on Monday night. Uncapped goalkeeper Shuaib Walters of mid-table South African club Maritzburg was picked ahead of Rowen Fernandez, who plays for German club Arminia Bielefeld, in the 23-man squad named on Tuesday. Bryce Moon, who plays in Greece, also missed out along with fellow defender Innocent Mdledle and midfielder Franklin Cale, both of SA Premier Soccer League runners-up Mamelodi Sundowns. "It was a very difficult and sad decision to make, some of these boys who have been left out have been with me since the Durban training camp in January," Parreira told the South African Football Association Web site. "But at the end of the day we have to follow the rules and regulations because FIFA wants only 23 players. My decision of leaving out these players was based on certain principles: physical condition, technical level, tactical knowledge, discipline as well as adjusting to the shape of the team. "But I would like to say to them, 'Thank you very much for your efforts, don't lose hope, just keep your heads high and remember that you are not failures.' This is also a sad time for everyone in the team." The squad includes seven overseas-based players, including captain Aaron Mokoena -- who became the first South African to win 100 caps against Guatemala -- and midfielders Steven Pienaar, Kagisho Dikgacoi and Macbeth Sibaya. Bernard Parker of Dutch champions Twente was one of only three strikers named along with Katlego Mphela and Siyabonga Nomvete. Everton striker Victor Anichebe and fellow forward Ike Uche were dropped from Nigeria's final 23-man squad. The duo lost out to a pool of forwards featuring three of Anichebe's fellow Premier League players: Yakubu Aiyegbeni, Nwankwo Kanu and John Utaka. Wolfsburg frontman Obafemi Martins, Osaze Odemwingie of Lokomotiv Moscow and Chinedu Ogbuke Obasi will also compete for starting berths in attack. Midfielder Jon Obi Mikel was included despite missing the end of Chelsea's season due to minor knee surgery. New coach Lars Lagerback also dropped his only two Nigeria-based players, goalkeeper Bassey Akpan and Peter Suswan, as well as Peter Utaka, Onyekachi Apam and Brown Ideye. The Super Eagles open their campaign against Argentina in Johannesburg on June 12, and will also play Greece and South Korea in Group B.
Cameroon coach Paul Le Guen gave Rigobert Song the chance to appear at his fourth World Cup, along with his nephew Alex Song of English club Arsenal. Tottenham defenders Benoit Assou-Akotto and Sebastien Bassong also made the 23-man cut, despite missing the Africa Cup of Nations. Inter Milan striker Samuel Eto'o will continue as captain, having replaced Song when Paul Le Guen took charge last year. While striker Jacques Zoua was already out through injury, the French coach also left out Jean Patrick Abouna Ndzana, Amour Patrick Tignyemb, Makadji Boukar, Jean Patrick Abouna Ndzana, Marcel Ndjeng, Patrick Mevoungou and Dorge Kouemaha. Cameroon are in Group E, along with the Netherlands, Denmark and Japan. Ghana captain Michael Essien has been ruled out of the World Cup due to injury, dealing a major blow to the Black Stars' hopes of success in the first tournament to be held in Africa. The midfielder has not played for his English club Chelsea since December, but Ghana coach Milovan Rajevac picked the 27-year-old in his preliminary 29-man squad in the hope that he would be fit to play in the tournament. But the Ghana Football Association announced that Essien, who has won more than 50 caps and is known affectionately by fans as "The Bison," will not be ready before the month-long tournament finishes in mid-July. "An evaluation by a combined team of medical experts from the Ghana Football Association and Chelsea Football Club revealed that Essien will not make full recovery until the end of July," it said in a statement on its Web site. Essien's latest problems began six months ago when he suffered a hamstring injury in a European Champions League match, but he returned to fitness in time for Ghana's second match at the African Nations Cup in January. But he then injured his knee in training, partially tearing medial ligament, and he needed to have several operations to repair the damage. The former Lyon player also suffered a serious knee injury in 2008 which sidelined him for six months. Earlier this month, Rajevac also named John Mensah in his preliminary squad despite the defender's injury problems. Mensah, who also plays in England on loan with Sunderland, has been sidelined with a calf injury arising from a physical complication which has plagued him in recent years. Midfielder Kevin-Prince Boateng, who also plays in England, was named by the Serbian coach after deciding to switch nationality. Rajevac also recalled Inter Milan midfielder Sulley Muntari, who was dropped for the Africa Cup of Nations in January after deciding not to play in a friendly against Angola. Algeria coach Rabah Saadane added five players to his initial 25-man squad to cover for injuries. Lazhar Hadj Aissa, Hocine Metref and Khaled Lemmouchia of Algerian club ES Setif have joined the Desert Foxes' Swiss training camp along with Mohamed Meftah of JS Kabylie and Germany-based striker Chadli Amri. Defender Nadir Belhadj and goalkeeper Faouzi Chaouchi were selected despite being banned for the opening Group C match against Slovenia due to red cards received in the Africa Cup of Nations semifinal against Egypt. While Portsmouth's Belhadj can play in the second game against Hameur Bouazza, Chaouchi is suspended until the final pool clash with the United States. Key midfielder Mourad Meghni, who plays for Italian club Lazio, has been ruled out of the finals with a knee problem that requires surgery.